Welcome to the DITA for Practitioners site. Note: This site is under active construction. Follow Eliot on Twitter (user ID "drmacro") for updates. 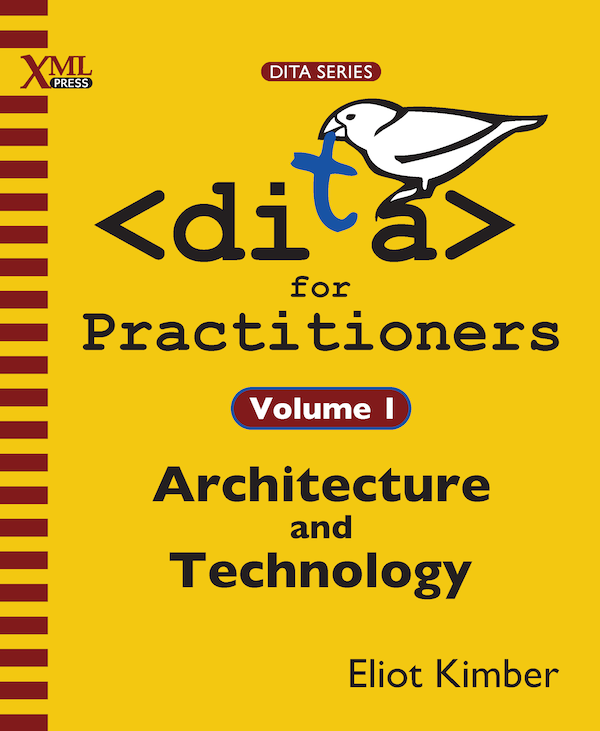 This is site supports the XML Press publications DITA for Practitioners Volume 1 and DITA for Practitioners Volume 2 by Eliot Kimber. Please see the main publication page for these books at http://xmlpress.net/publications/dita/practitioners-1/. Volume 1 is available now from Amazon, Barnes and Noble, and other online retailers. EPUB and Kindle versions coming soon. Volume 2 is being written now. Note: Volume 2 will include all of the Eliot Kimber DITA Configuration and Specialization Tutorials, which you can find at http://www.xiruss.org/tutorials/dita-specialization/. Those tutorials will continue to be available online once Volume 2 is published. The book and the Web site are produced from the same DITA source files. At this site you'll be able to find copies of the worked tutorials and other materials associated with the book. You can contact Eliot about this site or the book at info@dita4practitioners.com.